All hail the men and women who make sure that when Lord March calls in 2016, people can watch and hear cars made no later than in 1923 race hard for glory. These ancient machines are something new for sure. Once I walked through the tunnel and entered the pits at the 74th Goodwood Members’ Meeting, all I could do is geek out on the huge variety of Edwardian cars getting ready for the S.F. Edge Trophy, a 20-minute race for specials of a type that raced up until 1923. That’s the thing about Goodwood. When you think racing Grand Prix cars from the 1940s is dangerous, they continue the day by a full-on Can Am trophy. Nothing should be more terrifying (or louder) than that, but seeing cars from the early 20th century with the power of an airplane, the tires of a bicycle and the weight balance of Thor’s hammer can’t put their drivers anywhere but on the crazy train. Yet the lovely people building Edwardians for hill climbs or long trips to the continent will joke about all this, telling you these raw beasts are in fact great road cars as well. Apart from the lack of brakes, the annoying fuel consumption and the also non existent reverse gear, just great road cars. Please, take your time with gallery below. There’s much to see. Still with us? Good job. Since these cars came from a time before the rules came into play, what left the factory with a 1.5-liter V-Twin could end up with a 8.2-liter Curtiss V8 for racing, while something with a bigger chassis had no problem hauling a 10, 16.5 or 24.5 liter aero-engine up front either. In 1906, 1,000 lb-ft with roughly 300 horses was good enough for 122.5 mph and a land speed record at Daytona Beach. In 2016, only for the fourth place around the Goodwood Circuit with Mark Walker giving it all at the wheel. 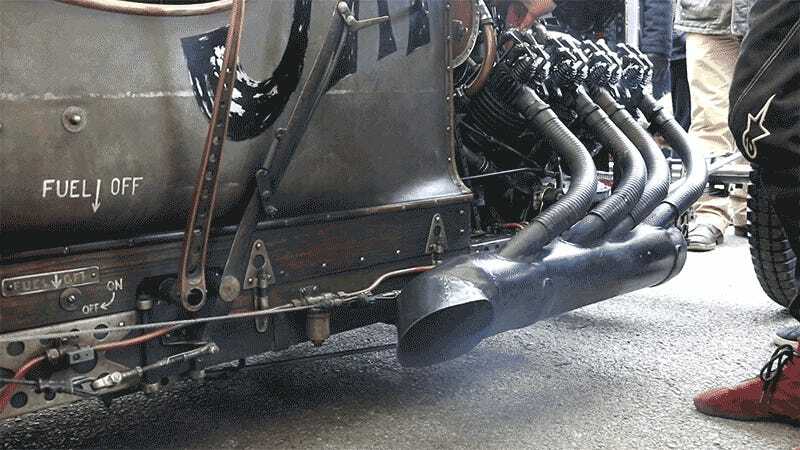 When I had a chat with Duncan Pittaway, a father of two and the Beast of Turin, he told me the Edwardian crew wasn’t even sure how this could work at Goodwood. While he though it was about time for certain individuals to realize proper race cars existed before 1960, due to size and speed difference between these cars, there was a slight chance for the whole thing to turn into an embarrassing disaster. But in reality, it was the exact opposite. The man in that bee helmet driving a V8-powered GN also entered his 1913 Monarch into the race, but in the end, it was the much smaller car from 1921 making all the big guys run for their money. Duncan says being chased by a pair of giants much faster in the straights before trying to make it all up in the corners was absolutely terrifying, but fun. His checkered GN Curtiss ‘Vitesse’ won the S. F. Edge Trophy by just 0.230 seconds after eight laps around the Goodwood Circuit, followed by Matias Sielecki’s 1923 Delage DHV12 and Julian Majzub’s 1916 Sunbeam Indianapolis. As of today, he only parks six pre-war cars in his garage.